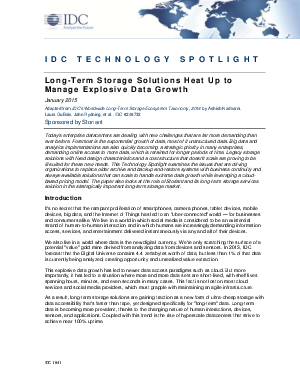 Read this new IDC Report about how today's enterprise datacenters are dealing with new challenges that are far more demanding than ever before. Foremost is the exponential growth of data, most of it unstructured data. Big data and analytics implementations are also quickly becoming a strategic priority in many enterprises, for demanding online access to more data, which is retained for longer periods of time. Legacy storage solutions with fixed design characteristics and a cost structure that doesn't scale are proving to be ill-suited for these new needs. The report also looks at the role of Storiant and its long-term storage services solution in the strategically important long-term storage market.